Lately some of our friends have been joking with us about the airport code roulette we play when selecting our destinations. 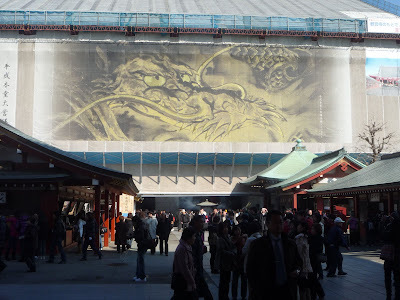 Well, Tokyo has been a long time coming... we had planned to go in 2008, but decided to visit South East Asia instead. Prior to any trip we research the destination to prepare ourselves so we can hit the ground running! We purchased three Tokyo guide books and spent untold hours reading Internet posts on everything from airport transportation to the best sushi bar at the fish market. 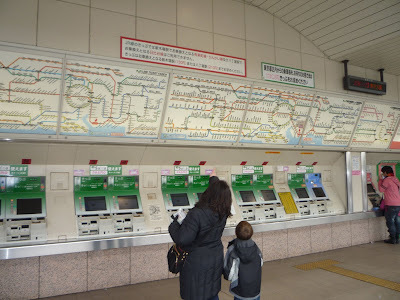 Subway signs are only in Japanese so getting around is impossible. The first thing we had to do was learn how to navigate the city via mass transit. Buying subway tickets for the first time was a little daunting. The signs were mostly in Japanese, but after a few tries, we were experts. It was only on the next to last day that we finally learned that we could buy unlimited trip day passes from the hotel which were much more cost effective. We didn't have enough time to fully adapt to the local time zone. 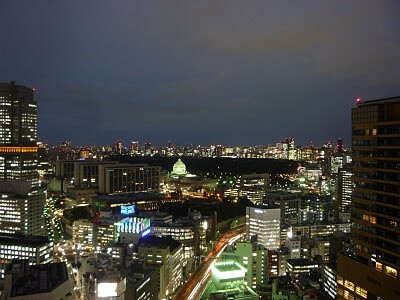 This was our only view of Tokyo at night (from our room) because we were usually wiped out by 7 pm. The first night we thought a late afternoon nap would refresh us but Elliot slept straight through to the next morning. 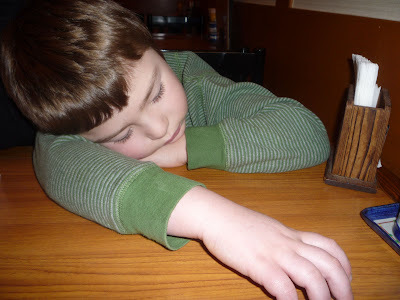 The second night we actually walked a few blocks to go out for dinner and Elliot passed out at the table within minutes of arrival. Towards the end of the trip we did manage to go out for dinner but we had to stay local and couldn't explore any other neighborhoods. This is Shinjuku crossing, one of the busiest intersections in the world and it seems that it is shown on any show that features Tokyo. Based on this frequently repeated image we thought that it was a typical intersection. Other than this, there are no raging crowds that we saw. We went to the second floor Starbucks which offers a panoramic view of the intersection but we were quickly escorted out when Keith started taking pictures. 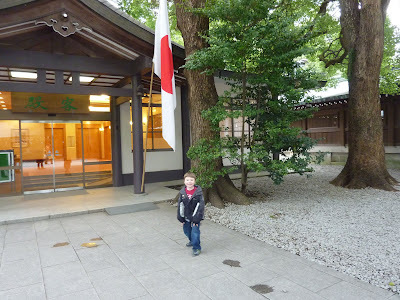 A morning visit to the Meiji Shrine. 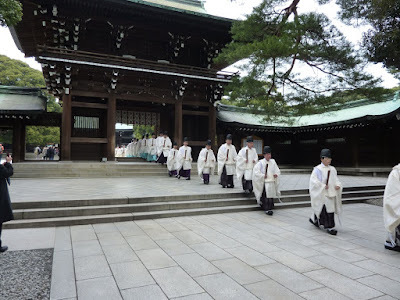 We were there on the 15th of the month when the Priests and maidens wear traditional dress while in a Procession. It was a pretty cool sight. 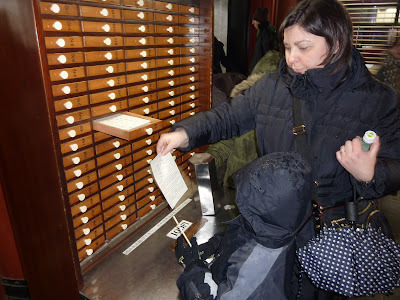 Elliot picks a fortune at the Senso-ji shrine. Snacks outside Senso-ji. These are Manju which are little cakes will filling. We tried the bean paste and sesame and both were delicious. 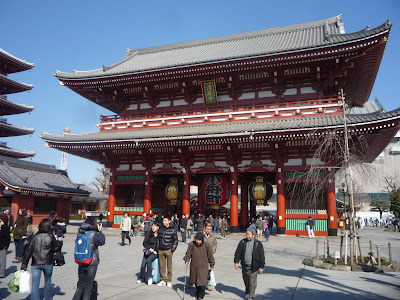 Senso-ji is a Buddhist temple located in Asakusa. A friend from work recommended a visit to the Edo-Tokyo Museum and we were able to learn more about Tokyo’s history and culture. 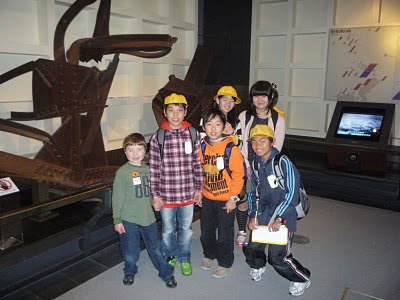 There were a few school field trips also visiting so the museum was packed. Elliot made some new friends who were very excited to practice their English with him. 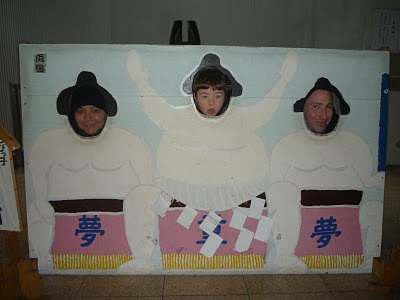 Next to the museum were the Sumo Stables. Unfortunately there weren't any tournaments during our visit. 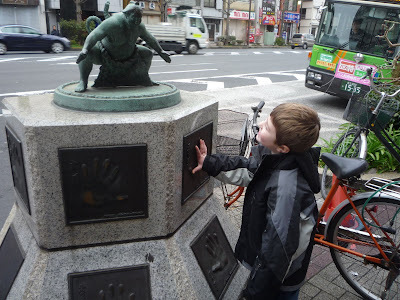 The monuments have hand prints of the Sumo wrestlers and Elliot did a comparison, realizing that they are huge. 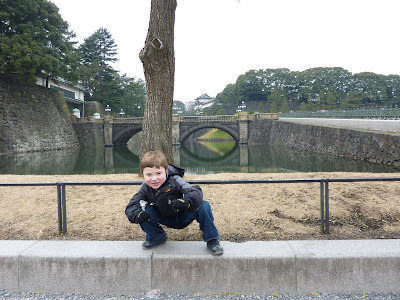 Elliot's best Ninja pose at the Imperial Gardens. Depachica are the food halls in the department stores in Tokyo. 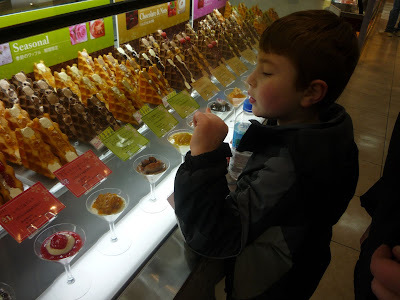 Each major store has 1 or 2 floors devoted exclusively to food. The food is mostly prepared and meant to be brought home or back to the office so there was no convenient place to eat it. 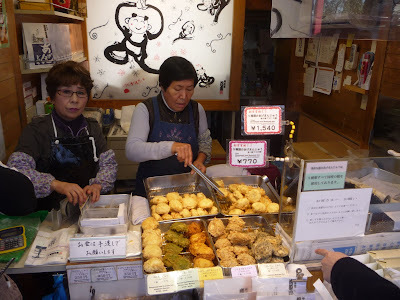 Because the Japanese have lots of cultural nuances, we didn't know if buying food and eating on the street corner was appropriate so we just enjoyed with our eyes. We did get some yummy filled waffles to eat back at the hotel. 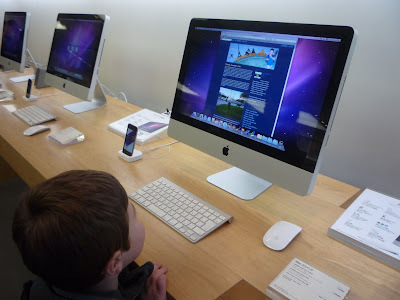 Elliot checks out "Traveling with Elliot" in the Apple Store in Ginza. We were ready for lunch and thought we could do a quick search in the store. The text was only in Japanese, so our plan backfired but a very kind salesperson came over to us did a few searches on Japanese Google Maps and gave us a great tempura restaurant recommendation. If your reading this at the Ginza Apple store, Thanks! 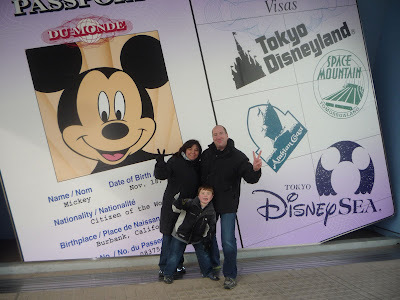 We decided mid-week to have a kid-centric day at Tokyo Disney. Being that it was a cold, rainy Wednesday in February, we thought we would have the park to ourselves. We arrived an hour before the park opened hoping to get an early start to the day. When our train arrived, there were already thousands of people waiting in line and thousands of more arriving with each train that pulled in. We were still optimistic that we would be able to get a few rides in without waiting in long lines. When the gates opened it was like a scene from a Godzilla movie with everyone running to every corner of the park (notice there are no young children). We didn't prepare a Disney strategy, so we leisurely strolled to the first ride where the standby line was already over an hour wait and our "fast pass" tickets were for 12:30pm. We thought heading to the back of the park would be better so we headed over to Thunder Mountain in the back corner. The sign said that the wait was 90 minutes but we didn't believe it because the line was moving fast. We should have believed the sign because the next 90 minutes was spent going back and forth through the line maze. We spent most of the time chatting with some Japanese teenagers who were in front of us. 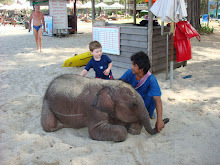 They thought Elliot was the cutest thing and they also enjoyed practicing English with us. Between the four of them they could usually get the message across. Whenever we would actually understand each other, they would clap and break out in a giddy laugh. It made the time go by for Elliot but he was getting hungry and we couldn't take the wait anymore. We abandoned the line with about 30 minutes more to go to get a snack and head over to the Monsters Inc. ride. Even though we only went on 3 rides, there were still some good things. The best part to us were are the differences. 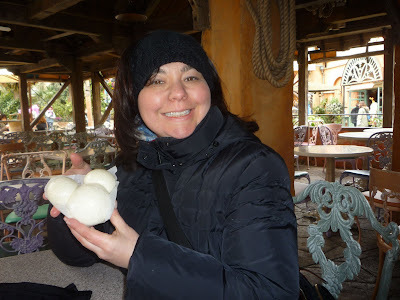 Like hearing Buzz Lightyear speak Japanese and having Mickey Mouse shaped Pork Buns. 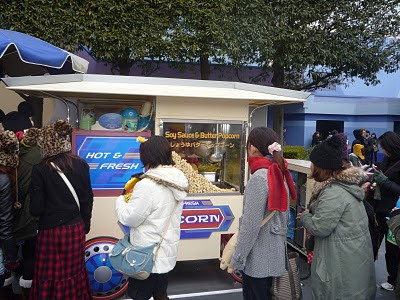 We missed out on the soy sauce and butter popcorn stand because it had a huge line, and we were tired of waiting in lines. The obligatory "Castle" Picture. 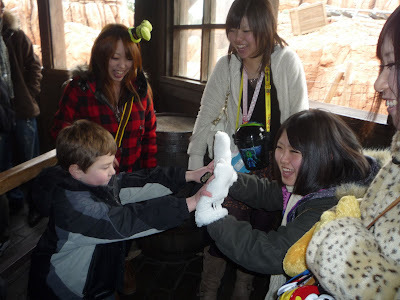 As it turns out, Tokyo Disney Land was his favorite part of the trip. Maybe it is the Magic Kingdom after all. Even when we went to a small neighborhood restaurant we found that there was always an English Menu which was usually offered without us having to ask. In one restaurant we ordered a "Japanese Egg Roll" as presented on the menu. Literally it was eggs rolled up. It was yummy, just not what we expected. 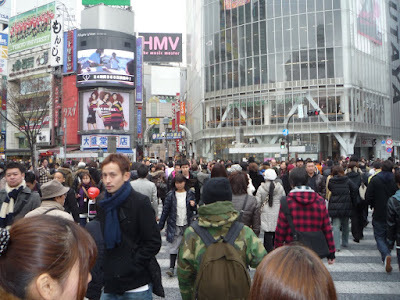 Tokyo has one other attraction that westerners love, but Japanese people don't understand why. It is the Kappabashi restaurant supply street where, in addition to normal restaurant items, you can shop for the plastic food replicas. Initially we thought we would buy a bunch of plastic food but we discovered that the plastic food costs significantly more than a real food. 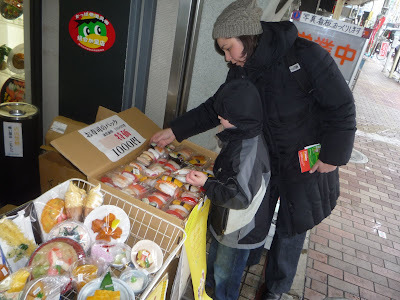 Eventually we found some tourist grade plastic sushi so we picked up a few pieces for a future "Show And Tell" day at school. We were fortunate enough to have a delicious omakase lunch at Kyubey, which many consider to be one of the best sushi restaurants in Tokyo. It was our splurge meal for the trip and it was so good that we think that we may never have a sushi meal that great again. It was the finest, freshest most delicious sushi that we ever had. 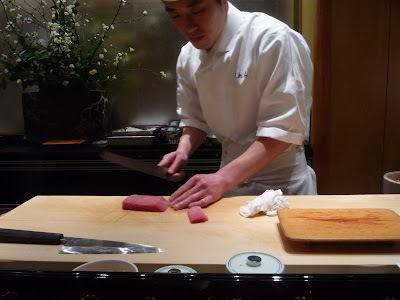 Elliot had the full omakase kept up with us piece by piece until the end. He even succeeded in the "Sea Urchin" challenge. He is ready to host "Boy vs. Food" if any Travel Channel producers are interested. 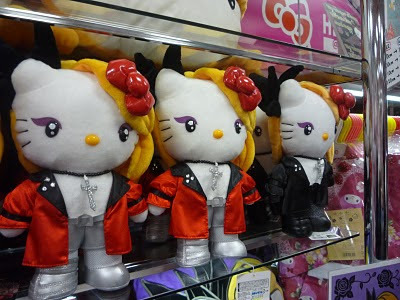 Hello Kitty is all grown up and ready to party but we heard that her parents are not too pleased. Taiyaki are fish shaped, filled waffles. Usually they are filled with azuki bean paste or custard. 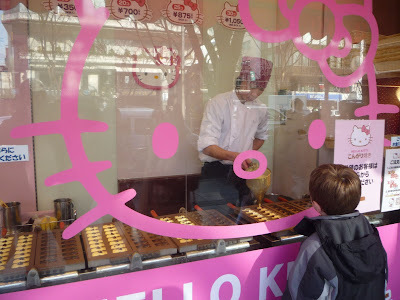 Outside the Kiddy Land Toy Store, they were shaped as Hello Kitty. So sweet and delicious. Elliot ate a half dozen of them. 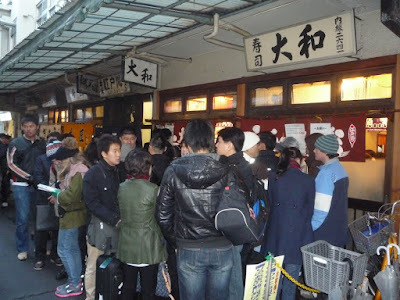 Because we were up early every morning, we made 3 visits to the Tsukiji Fish Market. Its a very interesting place to visit for several reasons. First of all it is the largest fish market in the world about 20% of all the seafood caught in the world is said to move through here. There are about 400 different type of sea creatures that are sold here, but unlike the aquarium they are destined for someones dinner plate. 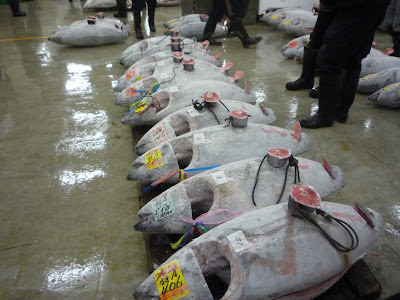 Above are frozen blue fin tuna that are caught throughout the world and sold here at auction. Before the auction begins the buyers carefully inspect the samples for quality. 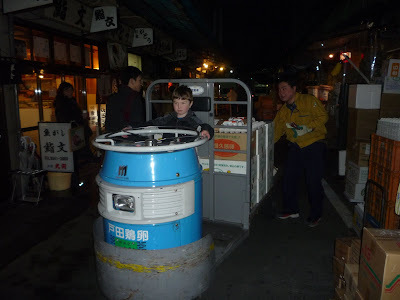 Goods are moved withn the market on fast moving scooters that can easily navigate the narrow passages. 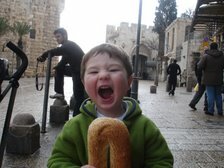 Elliot gets to imagine what it would be like to deliver fish and run over inattentive tourists. 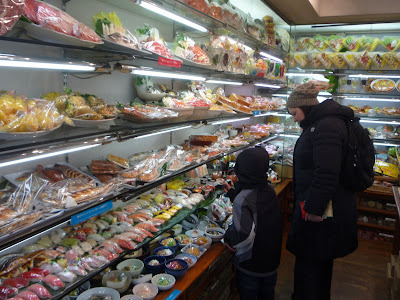 Part of the experience of going to the market is having fresh sushi at one of the small restarants. If you went to any of them you would have a phenominal experience but since we had the opprotunity to visit 3 we thoguht it was necessary to declare a winner. Many web sites say that the sushi restaurnats at the market are interchangeable but we found that was not the case. Third Place goes to Daiwa Sushi which had great fish and nice hosts. Second Place goes to Sushi Bun. It slightly edged out Daiwa on overall experience but Keith didn't like that they had a "no photo" policy. 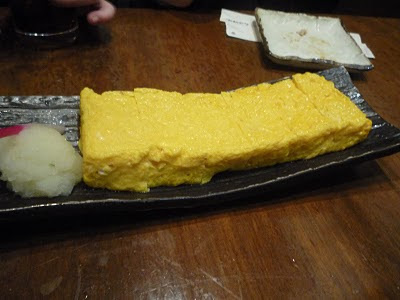 The clear winner (by a mile) was Sushi Dai which had the best everything from the Green tea to the Uni. On our last day we planned on going back for a second visit and we thought we were clever by taking a taxi directly there before the subways started running at 5:15am. We got there exactly at 5am and the wait was already 2 hours long. We loved it, but not that much. If you are looking to go there it may be a better idea to go later in the morning after the auction crowds are gone. We ended our trip in the Akihabara neighborhood which is part of town known for anything electronic (iPods to Toilet Seats). 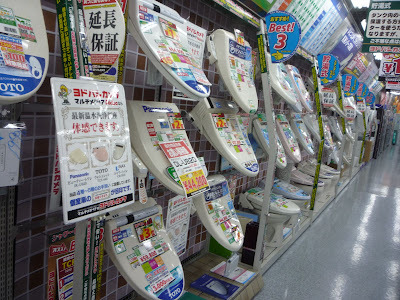 I wouldn't even think that toilet seats would have their own section in an appliance store, but since the seats are so technologically advanced it actually makes sense. They may not even have regular toilet seats because we spotted some of these installed at the subway station bathroom. 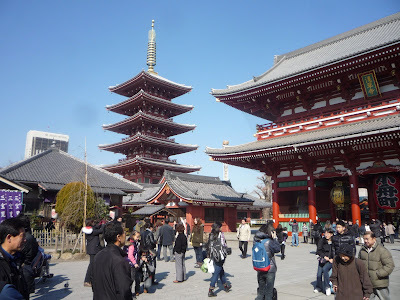 What about the preconceived ideas that we had about Tokyo? The subways are crowded, but not any more crowded than New York or other major cities. We almost always got a seat, even at rush hour. We did see the "pushers" but didn't see them do any pushing. The street address system made sense after a few days. Every street and subway station was also written in English so that was not a problem either and the taxi drivers had no problem getting us to where we wanted to go. While Tokyo is an expensive city it is not significantly different from New York or any other European capital and there are certainly bargains to be had. 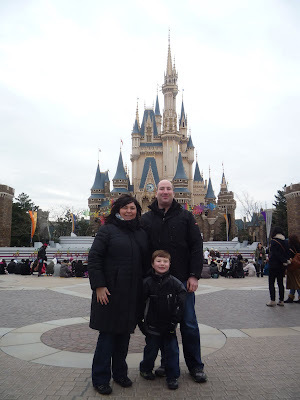 Without a doubt Tokyo was one of the best cities we have ever been to. The city is meticulously clean, the people are welcoming and the food was delicious. We will certainly be back! Hello! I did stumble across your blog and I love this post! We lived in Japan for 3 years and loved so much of this beautiful culture and these wonderful people! We someday hope to sail around the world, but for now we are lucky enough to be living in Germany and discovering Europe. Thanks so much for sharing your trip, I look forward to following your adventures.